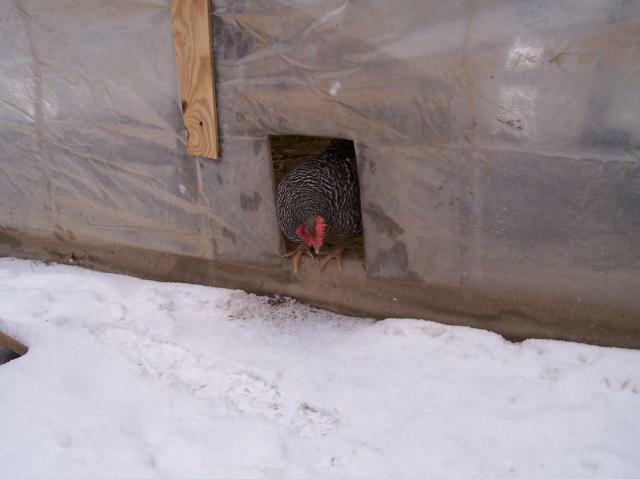 Some people wonder what I do with my chickens during the winter. 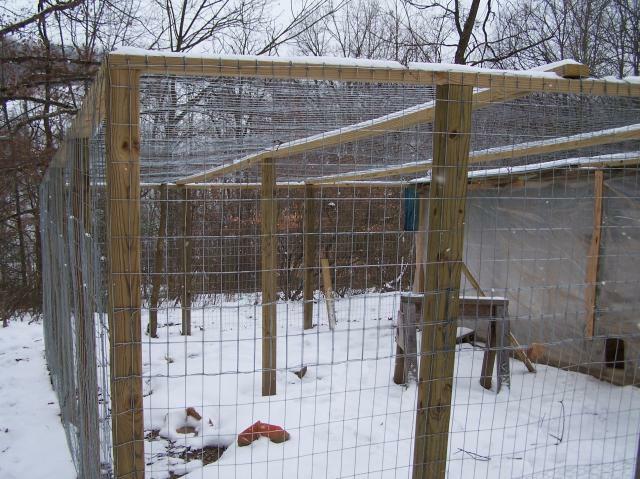 Here is what I have done to my coop and run. I also insulated a majority of the wall cavities and roof with R-13 pink insulation which I covered with 1/2 inch plywood panels (about $10 a sheet) to help retain some of the heat. I also installed 2 inch rigid insulation panels between the floor joists. They were cut to just barely fit and are held in with nails on an angle. My floor is covered with 4-6 inches of pine shavings and straw. I installed poo boards which I scrape daily to help keep the smell down and I then put it in a compost can outside the coop for my gardens later in the year. This is the outside of my SuperRun. As you can see, I have enclosed the entire run in 2x4 galvanized wire fencing. Even the roof to prevent hawks and other animals from entering from above. All posts were concreted into the ground about 18 inches and leveled. 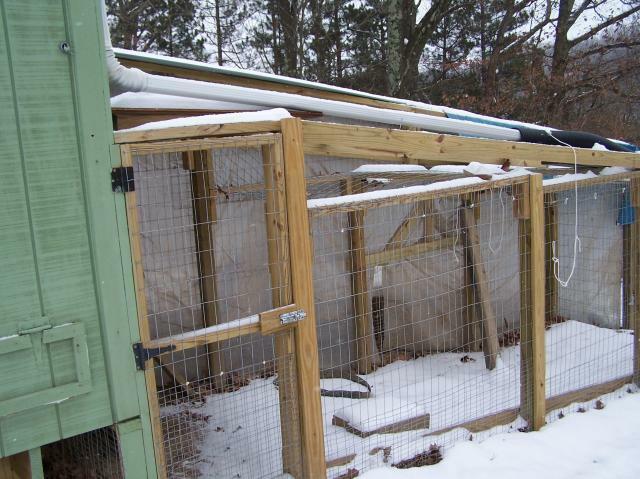 The right photo is the plastic I installed along the exterior of my run to keep the snow out and let the girls have some dirt to dust and scratch in. Occasionally I purchase a Purina Flock Block from Tractor Supply and give it to the girls. The left photo is the smaller run I intially built. 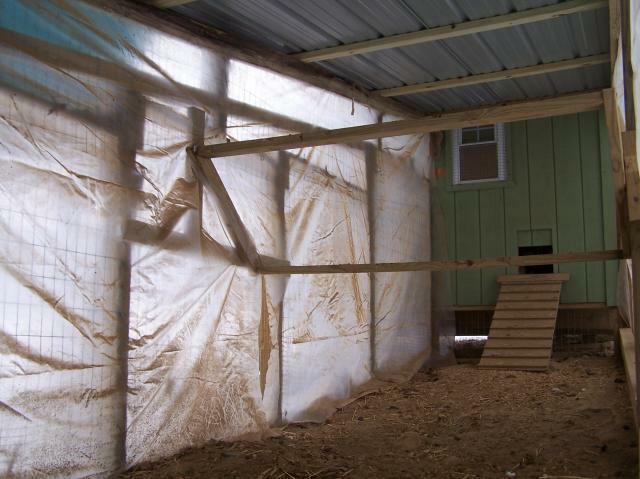 The plastic sheathing was installed the run. I have an entrance to each of my runs. The smaller run currently is closed since I have the Super Run complete. The right photo is the rear of my Superrun. 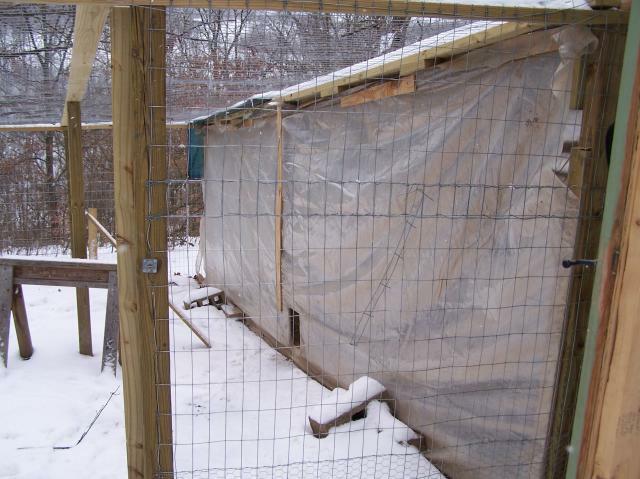 I ran out of funds to go all the way down with metal roofing so I installed a tarp temporarily. In the spring, I hope to purchase and install the other roof panels. The left picture is inside the plastic covered portion of the SuperRun. You can also see my roost I installed for the girls. The right photo is my girl Rosie coming out into the other side of the run before heading outside for a bit. Rosie outside in the snow. The left photo is my heatlamp setup. Both lamps have screws in the hoop clips in the ceiling to keep them from falling down. 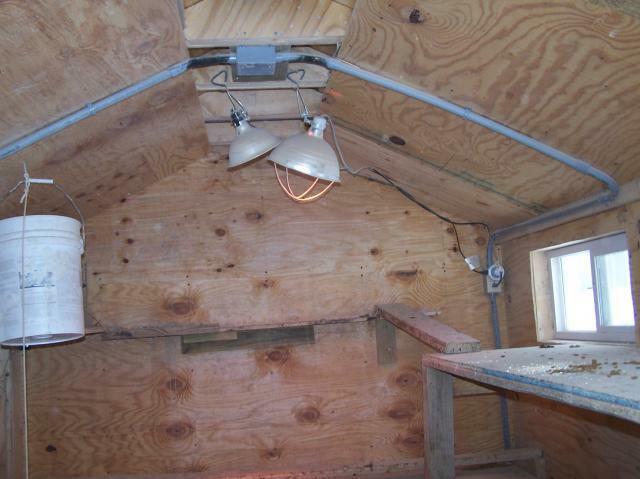 One lamp is my heat bulb and the other is my lamp for extra light inside the coop which is on a timer. The burnt areas by the lamps were from the torch I used to bend the conduit to the angle I wanted. This was done prior to installing any wire for the outlets. 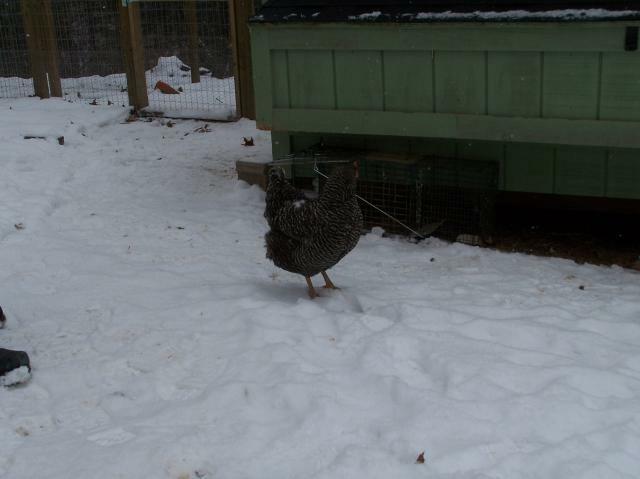 The right photo is my heated waterer. Its resting on 3 inch pavers to keep the waterer at the girls back height. 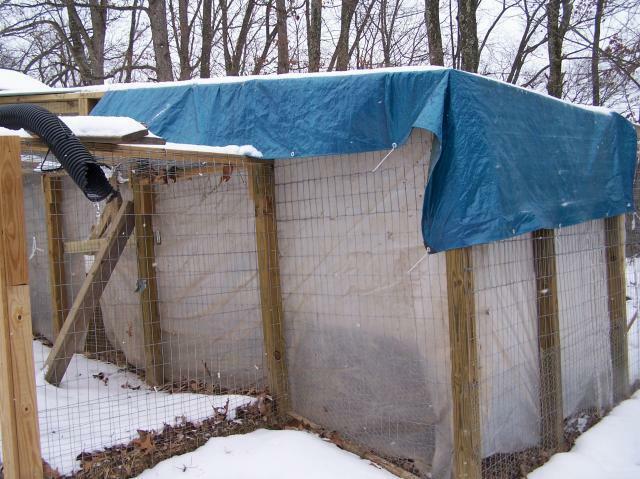 When it warms up in spring, I will remove the heater and pavers and place regular cinder blocks to raise the waterer level to the desired height. 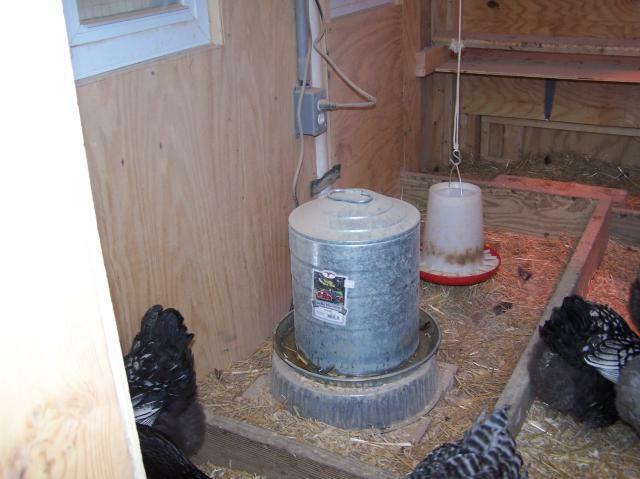 I need to install a few scraps of plywood to keep the girls from kicking hay and pine chips into the waterer area. 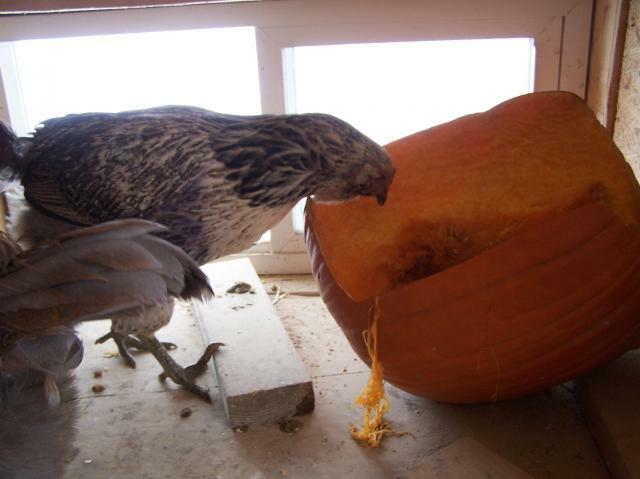 My girl Suessie eating one of the girls treats- pumpkin. After Halloween, I got some good deals on pumpkins that I have stored away to feed during the winter. They will eat it down to the skin. I also supplement their treats with black oil sunflower seeds, cracked corn, chicken scratch and the occasional kitten chow for added protein.